On the request of the American Red Cross and Association of Donor Recruitment Professionals (ADRP), this spring I presented lectures at six Chinese blood centers concerning donor recruitment best practices. In turn I experienced first-hand that while blood center operations differ between the two countries, the need for blood transcends all national and cultural barriers. 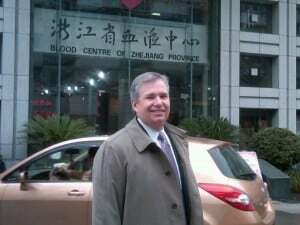 My itinerary included blood centers in Changsha, Guangzhou, Hangzhou, Jinan, Shijazhuang and Zhengzhou, all located in eastern China. The lecture series was planned by Caridian BCT, which sponsored the itinerary and was in response to feedback from Chinese blood center officials seeking assistance in improving their volunteer blood donor recruitment programs. In recent years China has transitioned from a paid to volunteer donor program. With double digit growth projected annually for the foreseeable future primarily due to increased access to healthcare and a corresponding increase in the number of surgeries and treatments that often require blood transfusions, Chinese blood centers realize that they must expand their recruitment efforts.